It’s official! 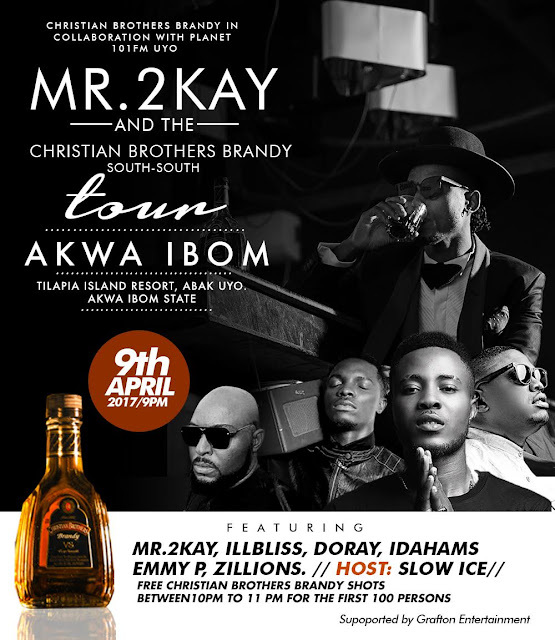 Singer Mr. 2Kay and his friends will be storming the City of Uyo this Sunday, April 9, 2017 to conclude his South-South Tour powered by Christian Brothers Brandy. The Grafton signee and ambassador of Christian Brothers Brandy will be joined by his multi-talented label mate, Idahams as well as Headies 2016 Lyrists on Roll Award winner, Ill Bliss and the soft boy – Doray to entertain and thrill fans and fun lovers in Akwa Ibom State. Mr. 2Kay and Christian Brothers Brandy tour kicked off on February 4, 2017 with the first show holding in Owerri followed by Port Harcourt, and Bayelsa. The singer is currently tidying up his desk ahead of his next album which will drop before the end of the year.